There is no preferred style that I have. I love it all: fly fishing, spin fishing, trolling with bait or lure. I can and will do it all! 5 Stars without hesitation! 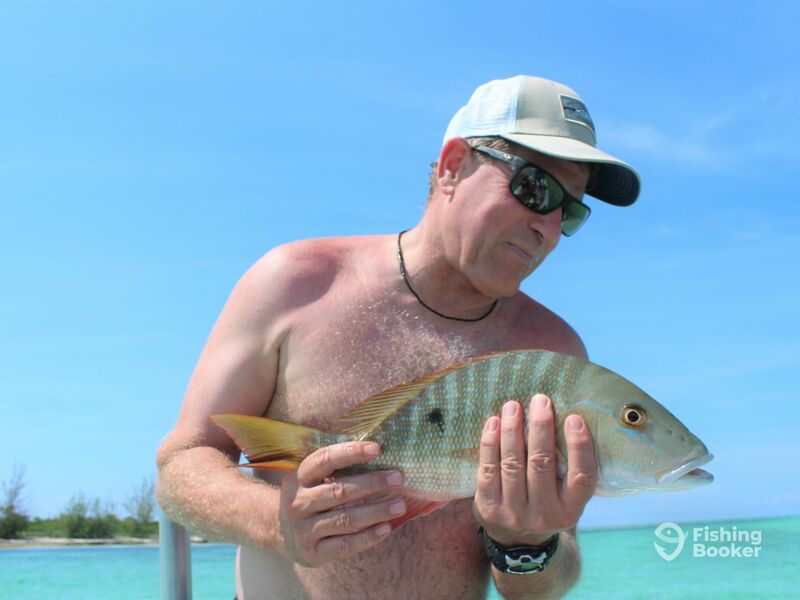 My daughter and I had an amazing time fly fishing, snorkeling, and boat touring the east end of Grand Bahama Island last Friday with Whitney Rolle. 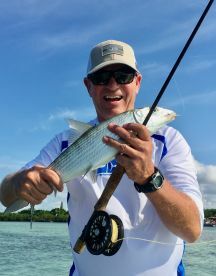 Targeting shallow water bonefish, I landed three and released them all. A determined reef shark showed up out of nowhere and tried to munch one of them. It freaked me out with how fast and aggressive the 5’-7’ reef shark was. Whitney, our guide, did a fantastic job. He taught me how to fly fish with minimum casualties. After an hour of bonefish fish fishing, we cruised along the southeast coastline through an eco-wonderland for miles. We drift snorkeled in crystal clear tidal creeks between several small islands. There were huge several species of sting rays and 6’-8’ nurse sharks all over the place. The water was so clear. We saw large barracuda, green sea turtles, tarpon, conch, and tons of beautiful reef fish in the green and turquoise Atlantic. I fished some more using a Diawa travel rod, Concept 13 bass reel and “Hookup Bait” jig. The snapper got on that jig like a hound on a hot dog. I’m told that these fish are a delicacy here in the Bahamas, so I gave both the snapper and a couple of jigs to Whitney in appreciation for an amazing trip of a lifetime. Thanks man i enjoy haning with ýou guys thanks for coming my way. My wife and I chartered a full day. Zero expierence bonefishing. They set us up with spinning gear and after a great breakfast we were off and running. We had good sun but a lot of wind. We still ended up with 20+ bonefish. The biggest being 25”s. Joe was unbelievably knowledgeable and a great guy. Highly recommended. This is one of the best fishing trips we’ve ever been on. I’m new to fly fishing, and their knowledge, patience and techniques are over the top fantastic. They put us on fish and we had a blast. We will definitely be back with them in the future, and we highly recommend them to anyone looking for a bonefishing trip in Freeport. They provided transport to and from our resort, there was a small restaurant at the dock for a great breakfast. They provided all the gear for fly fishing and spinning (with bait), plus drinks and sandwiches for lunch. Everything was put together just right for a great day on the flats. You will not be disappointed with this group, they know what they are doing and they are the best at doing it. Definitely would fish with Whitney again! I can’t recommend Whitney Rolle highly enough. First and foremost, Whitney has a passion for fishing and brings that to his boat. He loves to fish!! 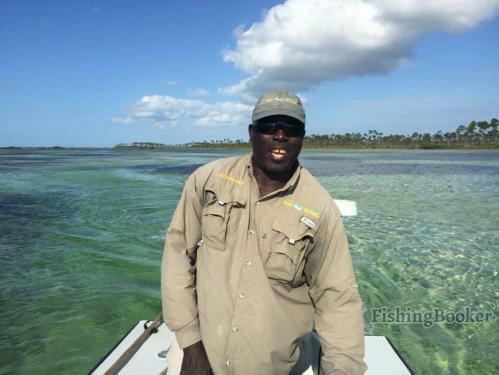 He knows bonefish habits and habitat, and eagerly shares that knowledge throughout the day. Whitney is the consumate professional. He understands that his clients are here for one reason - to have fun - and he delivers. The weather for our trip was awful (cold front, wind, and cloudy) which scattered the fish and turned the bite off but Whitney worked hard to get us on fish. Whitney talks as little or as much as you want to about any number of subjects during the day, but is always focused on spotting the next fish. 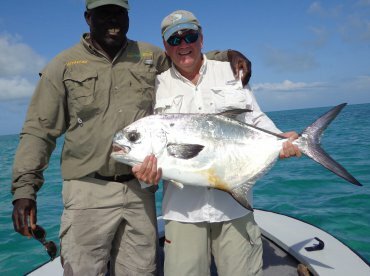 Whitney is an old school guy who respects the fish, his clients, and the other guides he competes with. This was my son’s first bonefishing trip and Whitney paid attention to the little things that allowed him to put fish in the boat under the toughest of conditions. He went to flats that were sheltered from the strong wind, positioned the boat for the best sun angle, best casting angle, and distance. He was very patient and when we blew a shot he smiled and said there will be another fish. He stayed out longer just to catch one more when other boats calling it a day. Whitney is a pleasant man to spend a day on the water with - the kind of guy who’d be your fishing buddy back home. He goes the extra mile to make sure you get shots and make the most of them. He’s the kind of man you can take your son out on the boat with and not have to worry about what he might learn or hear from the guide. 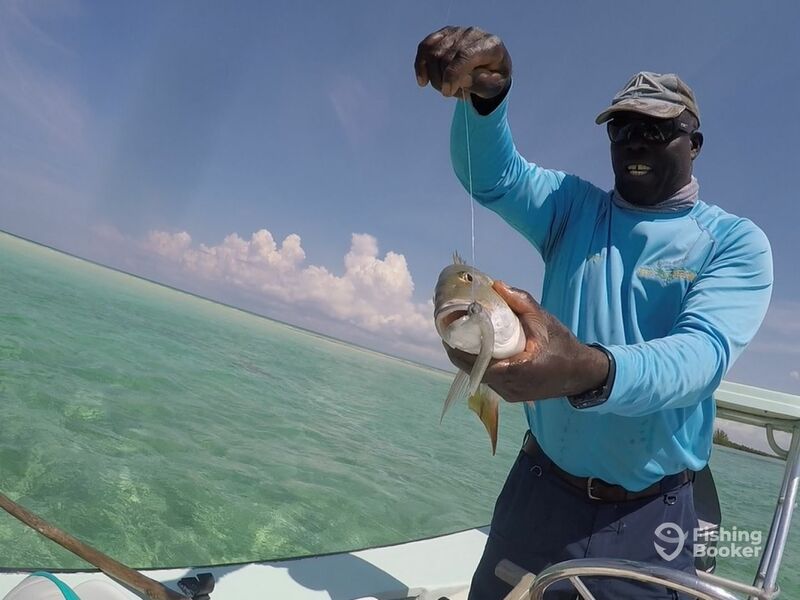 Whitney Rolle, also known as Wendy during his 29 year stay at Deep Water Cay, is one of the best bonefishing guides in the Bahamas. He knows where the fish are, where they are feeding and the type of fly to use for the situation. 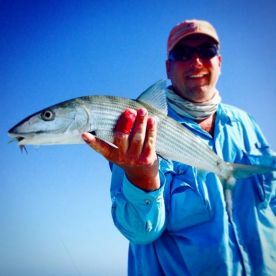 If you want to catch bonefish, no need to look any further, this is the guide you want. I always requested Wendy when I fished at Deep Water Cay and now that he is independent, I continue to make sure he is my guide in the Bahamas. Hey Rodney thanks so much as usual I alway enjoy fishing with you you are good people thanks so much for that great review.